Our "Diverse Youth Voices" (DYV) Essay Contest was launched in Fresno on March 25, and in this blog, I will share some background of the contest. I have called Fresno my home since 1997, when we moved here from the East Coast. One of my best early memories in Fresno was attending an all-day training by Pace e Bene, sponsored by Peace Fresno, Fresno Center for Nonviolence (FCNV), and other local peace & justice groups. It took place at the Islamic Cultural Center of Fresno, and I was so moved by the event that it stayed with me in heart and mind all these years. I began to get to know Pace e Bene, as a result. 2010-12. Living and teaching in Fresno, I've learned much about “the Valley,” its ever-growing population, its great disparities, and the great needs especially of under-served and marginalized communities. By 2010, I'd been hearing often about homelessness and participating in advocacy with others from progressive and faith-based groups. We all were searching and working to get at root causes and create change. It was at this time that I got to know Richard a bit, as we visited a few homeless encampments together, part of a city-wide interviewing project. It was his demeanor, his gentleness, his clarity, and his kindness that stuck with me. 2016. And the inequities in “the Valley” kept growing & growing. Changes in Fresno were here and there. So many injustices to speak out about, many lawsuits filed, winning success for the homeless and others, sometimes. In September, 2016, we got support for a City of Fresno Peace Resolution, and that same fall, community members worked on drafting a public statement about policing and the City of Fresno PD. This community effort culminated in a press release & press conference on January 3, 2017. But still, I don’t think we had a shared city-wide vision for nonviolence, for a nonviolent Fresno. But the involvement of K-12 youth in this search didn’t seem to be a high priority. It needed to be much better. Where are the educators; where are the K-12 kids, I would ask, as we searched for a more just, more peaceful Fresno? Are we all working together? Where is restorative justice in all of this? 2018. Richard passed away in August, 2018, but he left us all so much. This contest is made possible because of Richard, a local peace activist and writer, long-time leader and partner at the FCNV. To honor Richard and carry on his legacy, the FCNV decided to respond to those who donated in Richard’s name who asked about a writing contest. Everyone agreed that he would have loved to have a writing contest in his honor. Years ago, I was told, there had been an essay contest that Richard had initiated. As a writer, teacher of writing, and researcher of literacy & bilingualism, I wanted to help. And I had visited Richard in the summer of 2017, when he invited friends to tell stories as he recovered from a stroke. Telling stories, personal stories, was a one of Richard’s passions, and I was drawn to this as well. March 15, 2019: New Zealand Massacre at Muslim mosques, 50 persons killed, many others injured. The Fresno community responded in many ways, but how could we involve the youth? How could we help to honor the slain brothers and sisters in New Zealand, to educate about peace and nonviolence in Fresno? I called Angela at the FCNV again. March 20. Angela and I met and she told me that the FCNV Board had decided to give me the go-ahead to begin a contest. We shared ideas, and I told her that, for me, what made the most sense was to encourage youth voices that represented the diversity of Fresno. We had to listen to the kids tell us their vision for a nonviolent Fresno. She liked this, so I got to work. April 1. The contest has now been disseminated in Fresno, and many folks have told us that what we are doing would have made Richard very happy! We continue to disseminate the contest on social media, in community centers, and faith-based organizations. Thanks, Ryan, for the opportunity to share what we are doing here in Fresno. For readers of this Pace e Bene blog, we’d love to hear from you! April, May, June 2019. 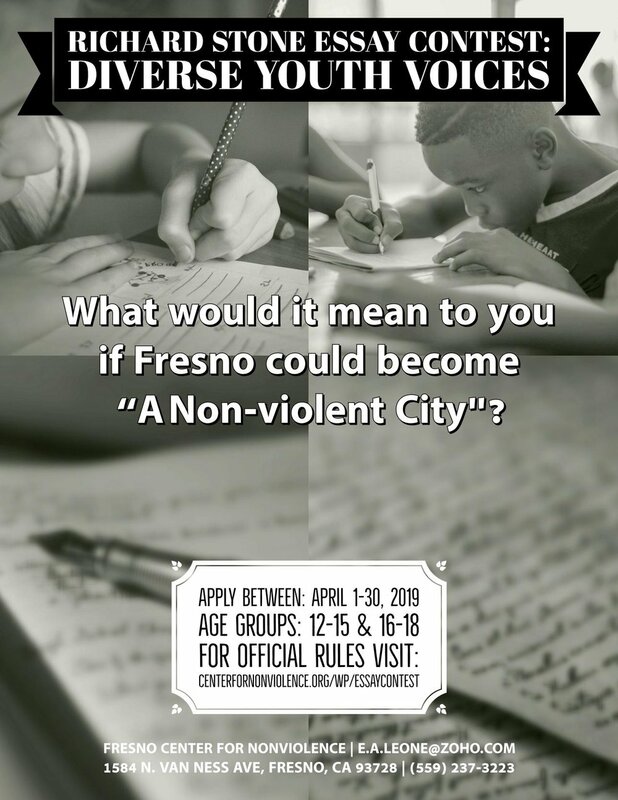 We hope that Fresno’s youth will help us to imagine and describe a nonviolent Fresno, believing that it is possible. After all, in the last few years, it is the youth who are leading in gun control, the world climate movement, and the Green New Deal. How can we afford not to listen to our youth? Click the PDFs to see more.